Devices for delivering air into an engine at pressures higher than atmospheric fall into two major groups -- mechanically driven (superchargers) and exhaust gas driven (turbochargers). GM's supercharged engines have historically incorporated the Helical Roots type supercharger produced by Eaton Corporation (fig. 1). An internal combustion engine functions as an air pump. The engine pulls air in on the intake stroke and pushes it out after combustion on the exhaust stroke. The amount of air being pumped through the engine is referred to as air throughput, and it can be measured as a volume. In a naturally-aspirated (non-supercharged) engine, air throughput depends on atmospheric pressure filling the partial vacuum created when each piston moves down on its intake stroke. Cooler air results in more oxygen in a given volume of air (density) and is also a key factor in prevention of detonation and the resulting need for spark retard. Cooler air is denser than warmer air,with more oxygen in a given volume of air. The oxygen contributes to the amount of fuel the engine can burn, and so, power the engine can produce. When heated by combustion, denser air expands more than warmer less-dense air, contributing to greater cylinder pressure. The supercharger increases engine power by forcing extra air into the engine. The intercooler (Charge Air Cooler) cools air after being compressed. The additional dense air (compressed and cooled) coupled with fuel in the correct mixture produces the additional power. The amount of power an engine can produce is proportional to the amount of fuel consumed. Fuel and air must be mixed in the proper proportion, so with more air throughput, and more fuel throughput, more power can be generated. 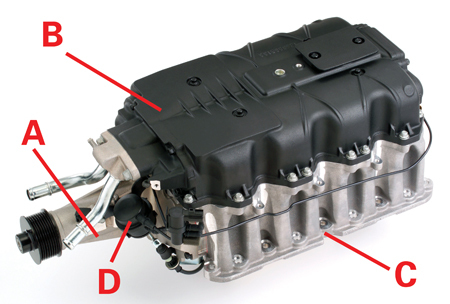 The supercharger transfers more air into the intake manifold (boost) than the engine could pump on its own. So, more power can be created than in a comparable naturally-aspirated engine. 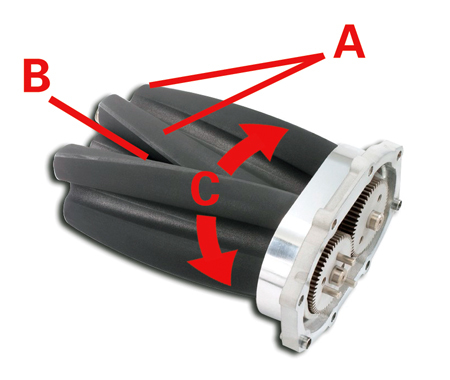 The supercharger drive belt is connected directly to the crankshaft and allows linear airflow delivery, meaning the supercharger displaces essentially the same volume of air per each rotor revolution, regardless of engine rpm. 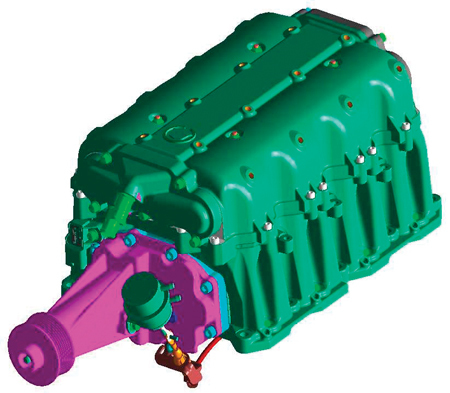 This increases engine torque across the entire operating range. Because the supercharger is always increasing air pressure/density in the intake manifold any time the engine crankshaft is turning, throttle response is immediate. The increased throughput of air and fuel allows more power to be produced with an engine of smaller displacement. This improves fuel economy when not under load, because the engine is consuming less fuel/air mixture because of the smaller engine size. Two tri-lobed rotors (fig. 5) are contained in a rotor housing. Air enters the housing through the inlet. It is trapped between the rotating rotor lobes and the housing. As the rotors turn, air is moved toward the supercharger outlet and into the engine's intake manifold. A drive shaft attaches the pulley to one rotor. In some applications, an isolator coupling is used between the pulley shaft and the driven rotor. A set of gears transfers drive to the second rotor. The gears and bearings are sealed in a housing containing lubricant. Each precision-machined rotor has three lobes which are twisted around the rotor axis, much like a shallow screw thread. This is called an involute profile with a 60° twist. The rotors run in opposite directions (counter-rotating), with the lobes meshed together. Air is simply displaced (moved from one side of the rotors to the other). The displaced air becomes compressed when it stacks up downstream of the supercharger, because the supercharger displaces more air than the engine can consume. Due to the involute design of the rotor lobes, the modified Roots supercharger operates with lower noise than other types of superchargers. Compressing air causes its temperature to rise, reducing its density. So it's necessary to remove heat from the compressed air before it enters the engine. An air-to-water intercooler (fig. 6), mounted between the supercharger outlet and the intake manifold, takes heat from the air passing through it and absorbs it into the coolant. TIP: The intercooler has its own cooling system, with its own radiator, separate from the engine. An electrically powered pump circulates coolant through the intercooler and its radiator. GM North American supercharger applications use an upstream throttle body. Air flows through the air filter, to the mass airflow sensor, through the throttle body, and into the supercharger. TIP: On the Cadillac engine, air moves upward from the supercharger outlet, through the intercooler, then downward into the intake manifold on each bank of the engine. Excess air, between the supercharger and the intercooler, is allowed to return to the supercharger inlet by way of a bypass valve. There are several advantages to the upstream throttle body. Both packaging and control are simplified, a smaller bypass is needed, and supercharger pulsations are better contained at part throttle. Typically, a supercharged engine is under boost only 5-10% of the time. The rest of the time, the bypass valve allows excess air to be diverted back to the inlet of the supercharger and recirculated. This ensures that the airflow measured by the mass airflow sensor reflects the amount of air actually being consumed by the engine. Using a bypass valve helps improve fuel economy. Under boost, the backpressure makes it harder to turn the rotors, so power is drawn from the engine crankshaft. In bypass mode, the only parasitic loss is the approximately one-half horsepower needed to overcome the frictional losses of the supercharger bearings and shaft seals. A second key benefit of the bypass valve is the reduction of noise during unloaded conditions (idle and cruising). Under high vacuum low load conditions, if not bypassed, the pumping pulses result in supercharger gear rattle. The bypass valve is operated by a vacuum/pressure actuator. Inlet vacuum and manifold pressure are used to open and close the bypass valve as needed. A supercharged engine has design requirements that are different from the naturally-aspirated engine. Typically, a supercharged engine requires a lower compression ratio. And a smaller displacement is typically used, to improve fuel efficiency. The supercharger has typically both the largest belt-driven spinning mass and the highest drive load. So, supercharger drive design is critical to system performance, controlling noise and long life. The crankshaft nose, front bearing and drive pulley joint must be assessed for power transmission and oscillating force levels. Because engine loading is significantly higher, piston assemblies, rings, rods and bearings are often upgraded. Valves and seat materials must be assessed for additional thermal and mechanical loads. Provisions are made to transfer heat away from the valve head area. PCV systems must be re-plumbed to use a check valve to prevent back flow under manifold boosted conditions. A vacuum source may be needed for vacuum assisted brakes and other vehicle system. Higher energy is needed to create a spark adequate to ignite a high pre-combustion cylinder pressure (boosted) mixture. Upgraded ignition is likely required, along with a different spark plug heat range. TIP: Whine noise is typical of all superchargers and is not a reason to replace the supercharger or other components. Supercharger whine, inherent to the Roots design, results from six pulses per engine revolution. (2:1 drive ratio x 3 lobes). Air induction system structure and acoustic resonators are designed to minimize whine. TIP: Whine is the noise character desired by many performance lovers. A whistle noise is generated by tooth contact of the spur gears between the rotors. For instance, a low level whistle may occur at 2300-2800 RPM at 80% load driving up a very long grade. Although most of these conditions are addressed by sound path isolation to the passenger compartment, some can still be heard by a very critical ear. Supercherger growl may be heard at low speed or idle, with the engine under light load. 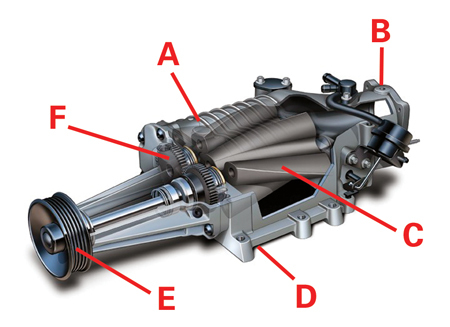 Minuscule crankshaft speed variations, influenced by the torque converter, transmission, drive shaft, differential, and tires, are transmitted through the flexible drive belt to the supercharger. Operating in very thin air, the rotors oscillate and cause the load to alternate from the drive to driven sides of the gear teeth. (Even precision parts have operating clearances.) The entire supercharger drive system is tuned to minimize this noise. On some current GM products, the supercharger incorporates an internal isolator between the pulley and the rotor shaft, which has two functions. The first is to minimize a knocking sound when the engine is turned off and the mass of the supercharger rotor set is suddenly jerked to a stop. And second, the isolator is tuned to minimize the normal engine firing pulses passed on to the supercharger rotor drive gears. It is active only in an unloaded condition (low engine speed point where boost is not requested). If the engine or one of the components in the driveline is not operating to design intent, the isolator may make a harsh intermittent rattle sound that often goes through cycles as the engine speed or other conditions change slightly. TIP: This noise is an attention-getter, but it's uncommon for it to be the fault of the supercharger. On 2006-08 XLR-V and STS-V, a rattle noise in the supercharger might occur at idle with the transmission in reverse. The bypass valve closes under this condition, resulting in the supercharger working against a vacuum with no bypass to balance the pressure, coupled with the isolator operating at the limit of its designed range. The noise is low level but may be noticed with the hood open. This is normal and will not be corrected by any mechanical repair or component change. Service to the supercharger itself is limited to the bypass circuit. Special procedures and required tools are explained in SI. From model year 2002, GM superchargers need no lube oil maintenance. When diagnosing any suspected supercharger trouble, familiarize yourself with the Attributes and Qualities above. 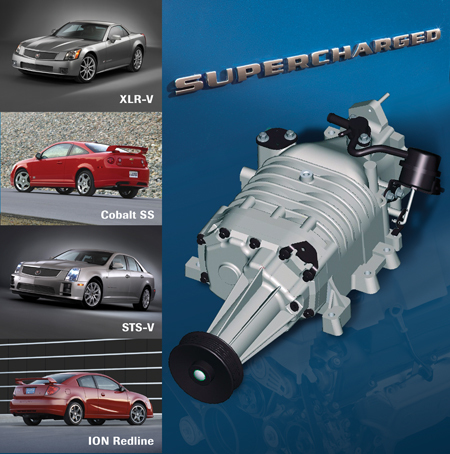 Like generators, power steering pumps, valvetrain drives and other powertrain systems, the supercharger has a characteristic low level noise. The unit and its surroundings are designed with care to avoid objectionable noises. Some noises may be heard only with the hood raised. The supercharger is a speaker for anything causing a rotational input disturbance. This includes fuel, other air delivery or measurement problems, ignition, sensors. Perform all system related diagnostics before focusing on the supercharger unit. TIP: Disconnecting the supercharger drive belt and running the engine is NOT PROOF that the supercharger is the problem. A very common problem is a vacuum leak, especially following service R&R work. Take care to ensure that all joints from the intake valve to the air cleaner element surface are sealed. Diagnostic codes can be set for Intake Air Flow Rationality and Fuel Trim when the intake system has even the slightest leak. In Roots superchargers of 2004 and later, an abradable coating is used to yield the best sealing after the unit is fully broken-in. There is initially a slight interference fit by design. The coating wears-in during the first 400 miles. Until it does, the added torque needed to turn the unit causes the isolator to operate out of the targeted design range. Typically, some level of rattle noise exists on new vehicles with zero miles. Posted - Tue, Dec 20, 2016 at 5:39 PM. This article has been viewed 2598 times.